Harry Dabbs hunt saddle- Like New! 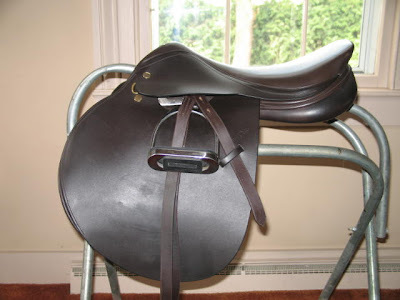 10 Responses to Harry Dabbs hunt saddle- Like New! this saddle is exactly what we have been looking for! is there anyway we can discuss trying it out? Hello, We are waiting for a response to our e-mail on July 13. Our trainer is letting us use his Harry Dabbs saddle and my daughter did great with it.He wants us to find one and yours sounds perfect. PLEASE respond. I would love to see a photo,if possible. We need it by the Buckeye Regional show in early August.Thanks in advance. I can email you a picture. What is your email address? Scroll up to see the added pic of the saddle. Thanks for the picture- my trainer is just back from New England show and I’ll ask him(David Earehart of Liberty Stables) to look at it today,if possible. I think it’s great and if he approves, we’ll buy it! I remeasured the saddle and I believe it’s 17″ not 17.5″ as advertised. Sorry about that. If you are still interested let me know. J.B., We had a great time at Buckeye Challenge show with the saddle and my daughter liked it. However, our trainer decided that it is just a bit too small for her and said we should return it to you.. He will keep his ears open for anyone looking for a great hunt saddle like that, so expect a call from me Wed. 8/13 about shipping it to you. Would Fed-Ex be OK? We have an account with them. Or, if you prefer UPS or U.S. Mail, that’s OK too.